Random Technology Ramblings » Facebook & HTML5 – What is all the fuss over? So in my new job I work with HTML5 on mobile platforms all day, with a product that I still can’t talk about (I will be able to soon). 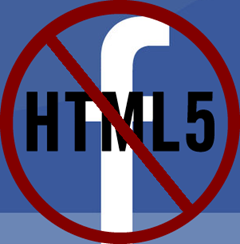 So when Mark Zuckerberg made is comments about HTML5 (read full statement) and the press jumped all over it proclaiming HTML5 on mobile was dead I was a upset by how much damage control I and anyone involved with Apache Cordova and other HTML5 mobile platforms are going to be doing for the next year. So lets take a look at HTML5 on mobile platforms and see what it’s good for and what it’s not. If you have not looked at Cordova (formally PhoneGap) or other such cross-platform solutions they enable you to create a single code base and have it run on multiple operating systems and devices. Like any cross-platform solution the cross-platform mobile solutions can’t take advantage of every feature of the platforms they target. Is this a problem? Yes and no! For the vast majority of applications that is not a issue, if you look at the applications I have on my Android device all of them could be written with Cordova. The advantage of using the cross-platform is that I can create an application and have it up and running on many devices without having to rewrite my application for each of the devices. I can’t wait to start sharing more information with the world!